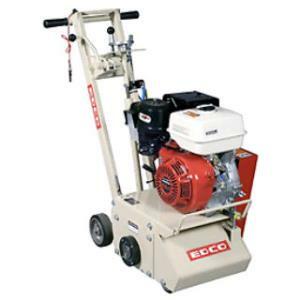 The EDCO 8" walk behind scarifier is the ideal machine for repairing sidewalk trip hazards, traffic marking removal, and creating non slip surfaces. It will scarify approximately 350-500 sq. ft. an hour at a depth pass of 1/8". The machine is equipped with a vacuum port, and weighs approximately 190lbs. * Please call us for any questions on our concrete planer/scarifier rentals in Hillsdale and Ridgewood NJ.